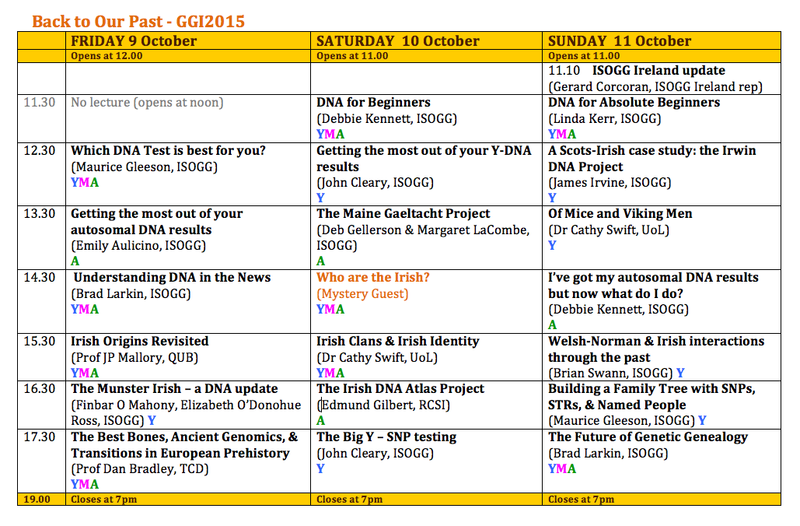 The two previous posts have explored Day 1 and Day 2 of GGI2015 at Back to Our Past. Let's take a look at what is in store for the final day of this year's conference. The morning starts off early with a brief update from Gerard Corcoran, ISOGG Ireland representative, on some exciting developments in Irish genealogy, including the new National Diaspora Centre, Epic Ireland, Big Data developments, and much more. 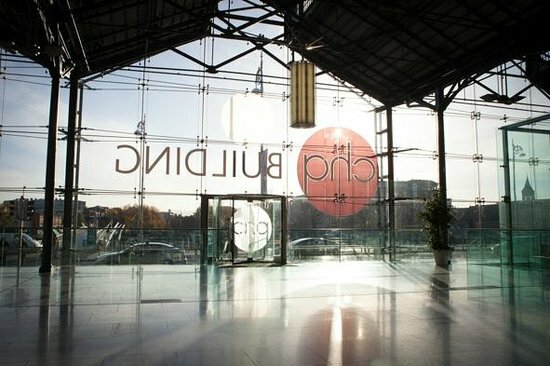 There will be a tour of the new National Diaspora Centre (due to open in May 2016) especially organised by Gerard for the FTDNA Stand volunteers and speakers on the day after the conference (Monday 12th October) but more about that in the next blog post. It is great to welcome first-time speaker Linda Kerr. This is Linda's first visit to GGI2015 and she gives a wonderful introduction to DNA for complete newbies. 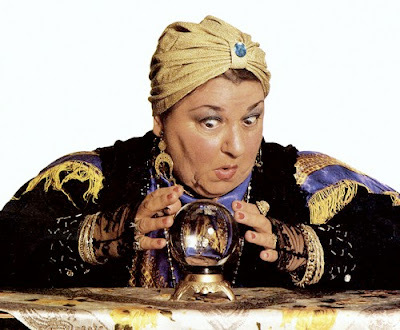 I have had the pleasure of hearing Linda talk in both Glasgow and Birmingham and her clear and concise delivery reduces complex concepts to understandable bite-size chunks for the absolute beginner. Linda hails from Scotland which is a nice segway for the following speaker, James Irvine, who will be talking about the Scots Irish. Using his own Irwin DNA Project as an example, James will illustrate the incredible influence of the Scots-Irish in both Ireland and Scotland. This particular project boasts nearly 400 participants and is one of the largest (if not the largest) surname studies conducted at FTDNA. It turns out that there are at least 30 distinct genetic families associated with the surname Irwin / Irvine, many of them with Scots-Irish roots. Recent Big Y testing offers fresh insights into popular understandings of what Y-DNA tests can and can't tell us about surname origins and spellings. We have several presentations on the Sunday relating to the influence of different ethnic groups in Ireland and James' presentation is just the first. Dr Cathy Swift of the University of limerick has been studying the Viking influence in Ireland for many years. 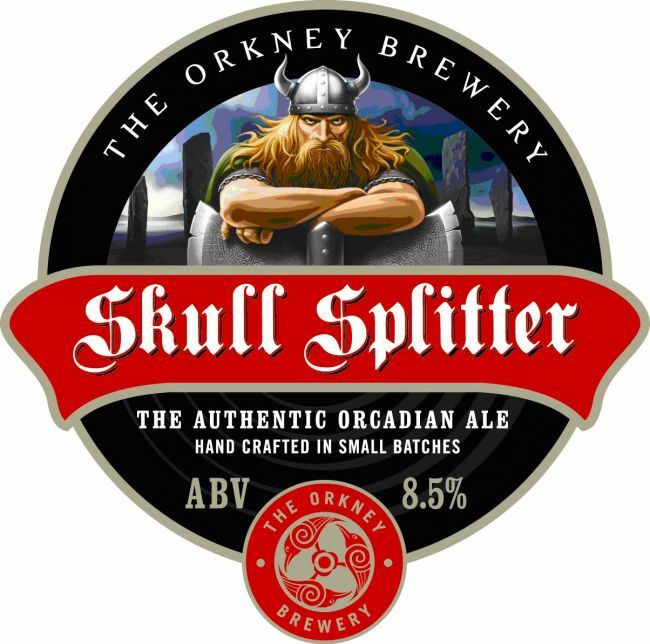 Here she explores what has been previously deduced about the Viking influence and questions these assumptions in light of more recent genetic evidence. And where do the mice come in? You'll just have to wait for the big reveal! Brian Swann will explore Welsh-Irish connections. Wales is the closest part of mainland Britain to Ireland, so migration across the Irish Sea to Wales in both directions has occurred throughout recorded history. Some of these interactions revolved around trade (e.g. the "native Welsh"), others around invasion (e.g. the Anglo-Normans), and some around plantation settlements. 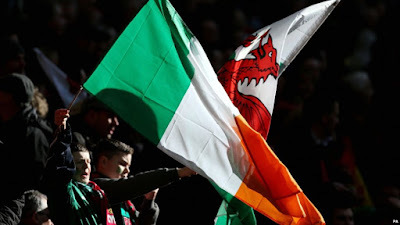 There are many fascinating parallels (and quite a few differences) between Welsh and Irish family history and Brian will explore these many facets, highlighting the recent discoveries regarding surname analysis that have come about due to DNA testing. 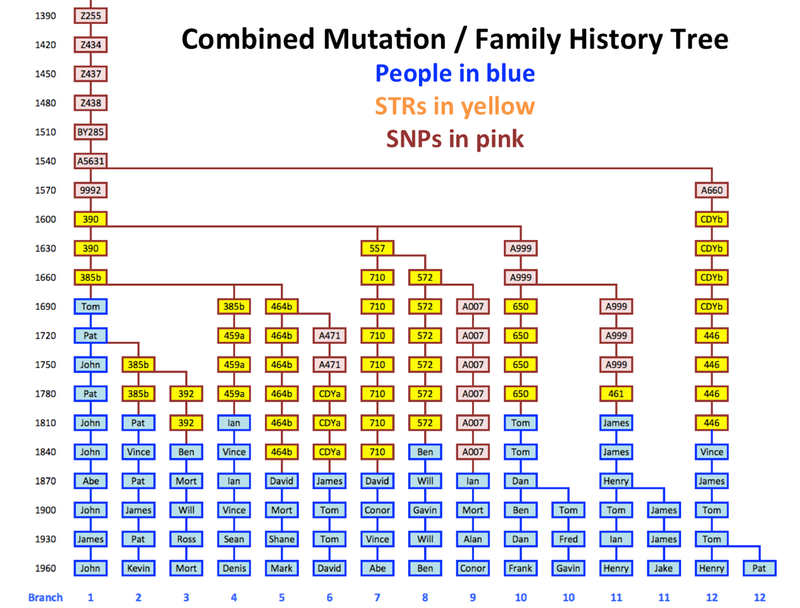 Debbie Kennett asks a very pertinent question that has certainly been on the lips of every genetic genealogist at some point in time: I've got my autosomal DNA results but now what do I do? Debbie will explain how to get the best out of your test results. What do those ethnicity percentages really mean? How do you know which matches are valid? What is triangulation? And what tools and resources are available to help you? 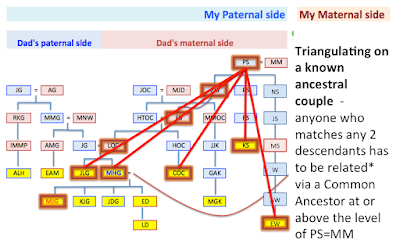 This is a must-see presentation for anyone who has received their autosomal DNA results and wants a bit of guidance for the next steps. Maurice Gleeson explores how to continue building your family tree when the documentary data runs out - is it possible to use DNA markers instead of people? 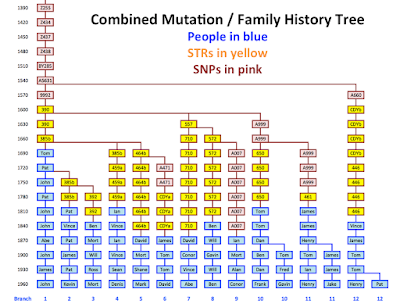 Using example from surname projects, Maurice discusses how to build Mutation History Trees (cladograms) using STR data, SNP data, and a combination of the two ... and then hanging known genealogies onto the branches. Is it possible? What challenges and hurdles do we still need to overcome? 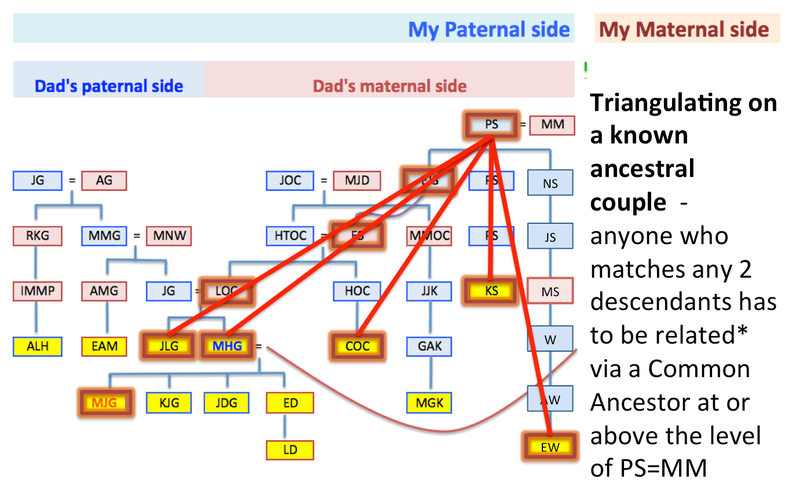 Can we actually define the branching pattern for a genetic family even when the paper trail has run dry? There is no better person to close the conference than Brad Larkin with his far-sighted presentation on the Future of Genetic Genealogy. This is such a rapidly changing field that we could give the same talk every year and it would be completely different. Brad will discuss what is on the horizon in terms of DNA markers, whole genome sequencing, DNA census versus DNA sampling, and the growth of reference databases, associated tools, and Big Data requirements. What better way to get us all fired up for GGI2016.